Finding mortgage information with a mobile device just got easier. The newly released Howard Hanna Mortgage Services app gives instant access to mortgage payment information for conventional, FHA, VA and USAD loans, the latest information on mortgage rates, instant contact for pre-approvals, instant contact for rate quotes and video tutorials on the mortgage process. 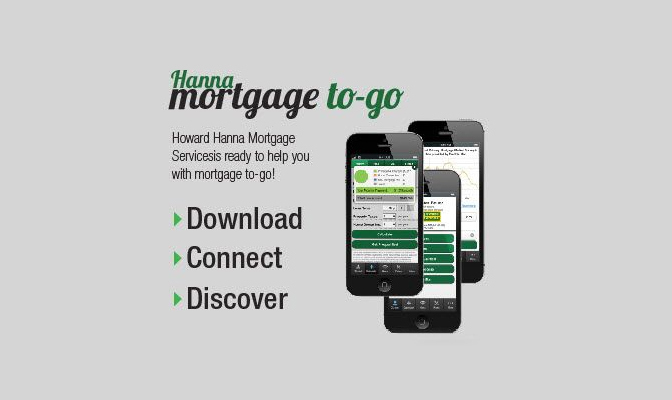 The Hanna Mortgage 2 Go app allows a Howard Hanna real estate agent to introduce a mortgage contact and information center to their client when considering financing options. The app allows the client to connect with this particular Howard Hanna Mortgage Loan Officer via their smartphone wherever they may be. They can also calculate to the dollar a loan payment on a potential new home, get pre-approved or request a quote. “Hanna Mortgage 2 Go is the ultimate tool for home purchasers. It provides a direct connection to a loan originator dedicated to providing the consumer the most competitive mortgage programs and pricing,” adds Mark Steele, President of Howard Hanna Financial Services. The free Hanna Mortgage App works on both iPhone and Android phones. It is shared by the agent to their client via text or email, or the app can be downloaded from HowardHannaMortgage.com. Howard Hanna Mortgage Services is the 4th largest real estate mortgage company* in the United States, with 7,619 transactions in 2013, totaling more than $1.2 billion. Contact Howard Hanna Mortgage Services at 1-800-474-4437 in Pennsylvania and 1-800-589-1118 in Ohio and Michigan.